Q: According to our information, China and the United States are nearing a trade deal that would stop the ban on US companies supplying the Chinese company ZTE. And in exchange, China would buy more agricultural products and also remove the existing tariffs on the US agricultural products. Is this true? Do you know when China and the US might announce this deal? And is it possible this could be announced next week when US Commerce Secretary Ross visits Beijing? A: Regarding the China-US trade talks in Washington D.C., I already talked about that at this podium yesterday. 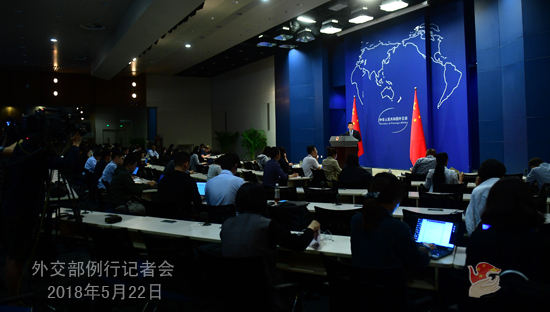 The two sides have issued a joint statement, and Vice Premier Liu He also briefed on the negotiations when giving an interview to the media after the negotiation. What you asked about is included in the joint statement. The two sides have reached an important consensus and will conduct consultations on how to implement that consensus specifically. The US side will send a high-level delegation to China for specific consultations in corresponding fields. You may need to wait for a while for more details to come. Q: US President Trump said on Twitter that China must continue to be strong and tight on its border with the DPRK until a deal for denuclearization is made. What is China's comment? A: First, China has always strictly followed and fulfilled its due international obligations. 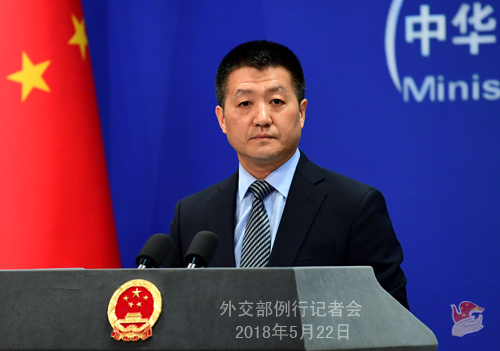 Second, as a friendly neighbor to the DPRK, China has maintained normal exchanges with it under the precondition of not violating its own international obligations, including in the economic and trade areas. There is not necessarily a contradiction between these two things. Q: According to foreign media reports, State Councilor and Foreign Minister Wang Yi and Australian Foreign Minister Julie Bishop had a candid talk for an hour on the sidelines of the G20 Foreign Ministers' Meeting. After that, Foreign Minister Bishop said she would visit China shortly. Some media previously said that she paid no visit to China in the past two years or so, which indicated that China-Australia relations are facing difficulties. Could you give us more details on this meeting between the two foreign ministers? A: State Councilor and Foreign Minister Wang Yi met with Australian Foreign Minister Julie Bishop at her request on the sidelines of the G20 Foreign Ministers' Meeting in Argentina. The Chinese side has issued detailed information about their meeting. We can conclude from the released information that the Australian side talked about its thinking on and raised some expectations for improving relations with China. On the Chinese part, State Councilor and Foreign Minister Wang Yi approached our bilateral relations at a fundamental and macro level, making it clear to Foreign Minister Bishop that for a sound China-Australia relationship to work out, one fundamental issue needs to be sorted out, which is that the Australian side must adopt a correct perspective. State Councilor and Foreign Minister Wang Yi clearly pointed out that first, China-Australia relations have recently faced difficulties, which even dampened our exchanges and cooperation, and that is something China does not wish to see. Second, China has noticed the various positive statements recently made by senior Australian officials, including by Ms. Bishop herself, on improving ties with China and on adopting a correct understanding of China's development. They expressed the strong will of the Australian side to improve bilateral relations and China is also ready to communicate with the Australian side over the issue in due course. Third, China attaches importance to its relationship with Australia. We hope that the Australian side could act upon its goodwill with concrete actions. Fourth, State Councilor and Foreign Minister Wang Yi stressed that if Australia sincerely hopes that the relations between the two countries could return to the right track and sustain sound development, then it must break away from its traditional thinking, take off its tinted glasses to look at China's development from a more positive angle, and provide more driving force for cooperation between the two countries. To sum up, State Councilor and Foreign Minister Wang Yi clarified on a macro level that if the Australian side truly seeks to improve and develop its relations with China, it must first of all address its problem of perception, which will offer a fundamental guarantee to the sound, steady and sustained development of bilateral ties. Q: Following the reelection of Venezuelan President Maduro, the US government has put more sanctions on Venezuela, specifically seeking to stop any US individuals or companies from buying Venezuela's debt. China and Russia have lent Venezuela a lot of money over the years. A US official said that they have had discussions with both China and Russia about that, and the US is not happy that China and Russia continue to lend money to Venezuela. What is China's response? Will China continue to provide loans to Venezuela? A: There are three points I would like to make. First, the latest general election belongs to Venezuela's internal affairs. A fundamental principle of China's foreign policy is non-interference in others' domestic affairs. Second, if there is any difference, divergence or even contradiction between the US and Venezuela, we sincerely hope the two countries can properly resolve their differences and problems through friendly negotiations. Third, I don't think others should interfere in China's normal relations, including normal cooperation with countries around the globe. Q: The World Health Assembly (WHA) this year has decided not to include the Taiwan-related proposal in its supplementary agenda. What's your comment? A: This year's WHA resolutely and neatly refused to incorporate into its supplementary agenda the so-called proposal of "inviting Taiwan to attend the WHA as an observer". This decision safeguards the dignity of the relevant resolutions of the UN General Assembly and the WHA, fully testifying to the fact that the one-China principle is the shared aspiration of the international community and the trend of the times. China welcomes this. 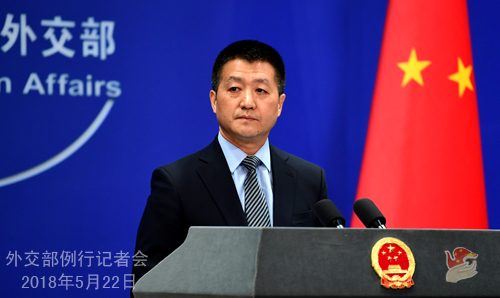 I would like to reiterate that the Chinese government is willing to properly handle the issue of the Taiwan region's participation in the activities of international organizations in accordance with the one-China principle.